How to get on the Regional Map? Nations will not be added to the map until they have been in the region for 28+ days. You can still request beforehand, however. You must have some national information available (be it in the form of a factbook on the main site, or a post within the forums). The plot of land you'd like. If you're proficient in any image editor, feel free to download the map, cut out the bit you want, colour it in, and post it back! Otherwise, a simple description will do. A link to that national information I mentioned earlier. Your capital city, or a major one, so I can put that on the map too. Don't make a massive claim. Sure, a fluid scale is used on this map, but don't take the biscuit. If you go RP-ing your nation is the size of Russia when it's the size of Nellietopia on the map, then I won't be too impressed. Nations that are puppets of other users must declare themselves as such, and also actively RP the claim of the puppet nation (and provide a link to said RP in their application). 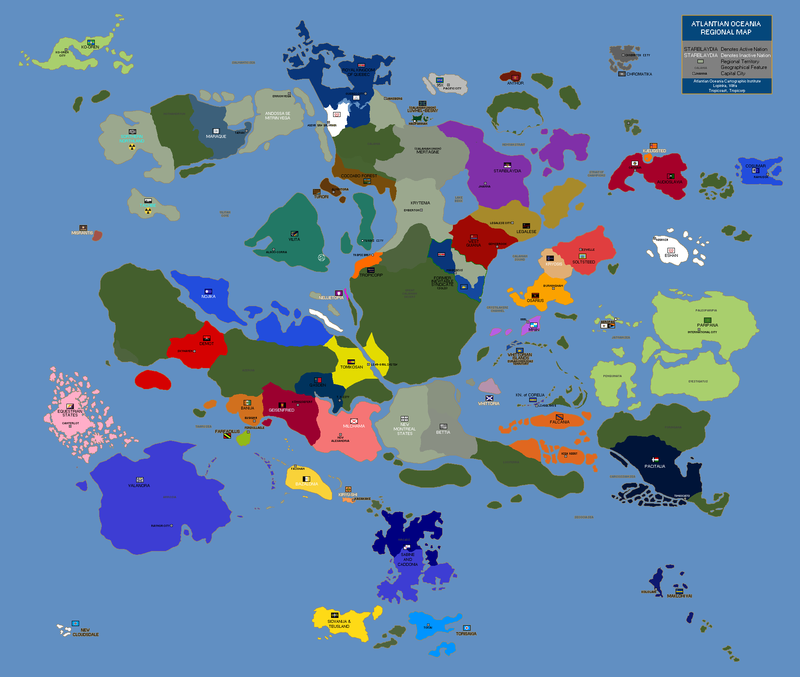 All claims are subject to approval - the Atlantian Oceania Cartographic Institute is a fickle mistress, and claims that are deemed terrible or improperly submitted will not be accepted. Feel free to try again, however. If you don't like any of the lovely plots of land available, then land can be created, however this will be reviewed with an even stricter eye than any other claim. The preference is always going to be to use existing land - even if it need be 're-shaped' - opposed to just dropping an entire new Island somewhere. Seriously, we've got a lot of nice mainland - why not take some of that? Please include the word "Abracadabra" in your application, as we all know that you don't get anything you want without saying the magic word. Also, it shows you've at least read this far. Although, please do read on. We can add things like lakes, if they're particularly important, however they cannot be placed where other features had been RP'ed before - like the Great Calanian Desert, for example. Nations that have CTE'd will remain on the map for a timeperiod after their extinction as deemed appropriate by the AOCI, and if they have made a significant contribution to the region or to the greater forum (as is the case with choice nations included on the map), this will be extended further (or indefinitely). And that seems to be about it! Any more questions? Reply or use the TG system. Posted in the last map thread, but your claim hasn't been processed? Post a new one here, meeting all the criteria! Happy mapping! The Republic of Flavovespia would like to claim the island located South of Osarius, or an island with the same shape if that is possible. Our factbook can be found below, with a map of the nation including the capital. How about a nice archipelago? After some very in-depth thinking and a bit of research, I would like to formerly make a claim on the AO Map, seeing as how I have been in the region for a couple of months. 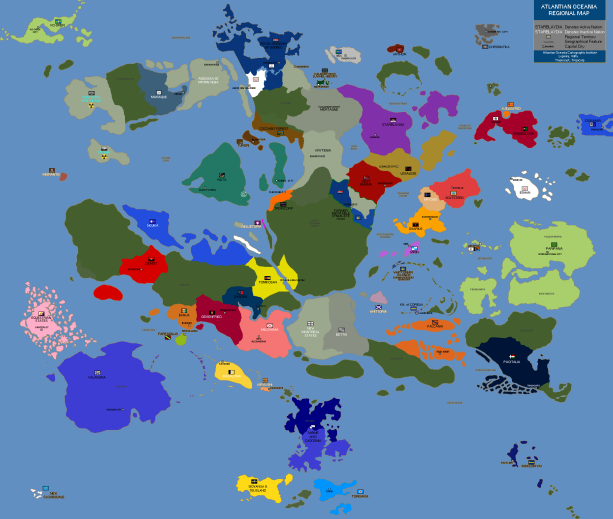 Also, if possible, could I get a higher resolution map of my claims, so that I may begin drawing up all those wonderful nation maps; provinces, military commands, cities, sports team influences... Yes, all those wonderful things. Obviously, the Factbook is going to be out of date, at least until I can write up a newish history, add a recent map, and work out the population numbers and land areas of the claim. The Avatarian Republics of Gyatso-kai will live on!